This door, Macy's is starting Black Friday at 6 p.m., which is actually Thursday. Black Friday? More like Black Thursday. Macy's (M) plans to open the doors to its namesake stores at 6 p.m. on Thanksgiving, even though Black Friday -- the traditional kickoff to the holiday season -- won't start for another six hours. Macy's used to start its Black Friday shopping at midnight on Thanksgiving, like many other retailers, including WalMart (WMT) and Toys R Us. But in recent years, stores have been opening their doors earlier. Macy's started doing this last year, when it opened to Black Friday shoppers at 8 p.m. on Thanksgiving. Of course, this means that a lot of employees will be working on Thanksgiving. But Macy's said that they've all volunteered for the holiday shift. "We work diligently to staff Thanksgiving with associates who volunteer to work and doing so means that our people are able to make their own decisions about how they contribute to our most important and busiest weekend of the year," said Macy's, in a prepared statement. "We also heard last year from many associates who appreciated the opportunity to work on Thanksgiving so they could have time off on Black Friday." Macy's said the workers are getting "incentive pay." Related: Black Friday: Is it worth it? So why do shoppers leave the comforts of home and hearth on Thanksgiving to crowd the aisles and compete with other frenzied shoppers? The retailers lure them with promises of Black Friday discounts, though there has been some debate as to whether the discounts are really worth it. In recent years, consumers have been shifting more and more into online shopping. A particularly robust date for online shopping is Cyber Monday, which is the Monday after Black Friday. Last year, Cyber Monday shopping set a record. But discounts aren't the only reason. 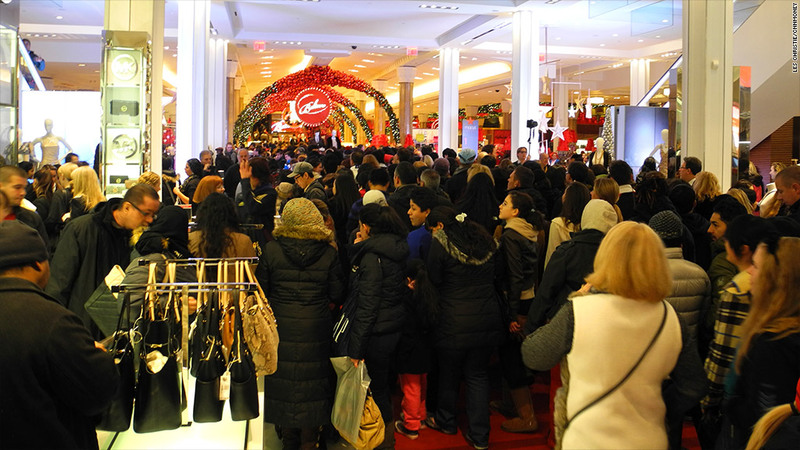 Over the years, many shoppers have said they go shopping on Black Friday because it has become an exciting cultural event. Stores in tourist locations, such as the Toys R Us in Times Square, attract shoppers from all over the world -- and also non-shoppers who just want to check out the scene.